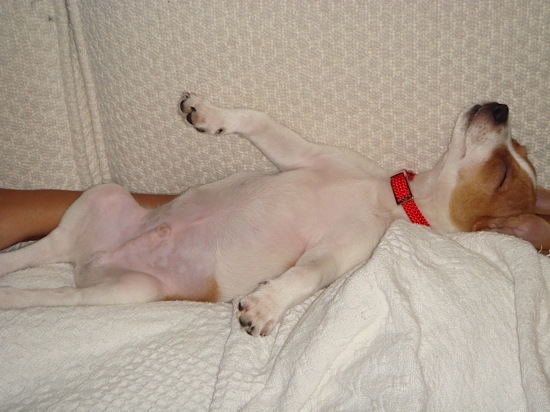 On this page you willl find Jack Russell Terrier photos submitted by our visitors from all over the world. 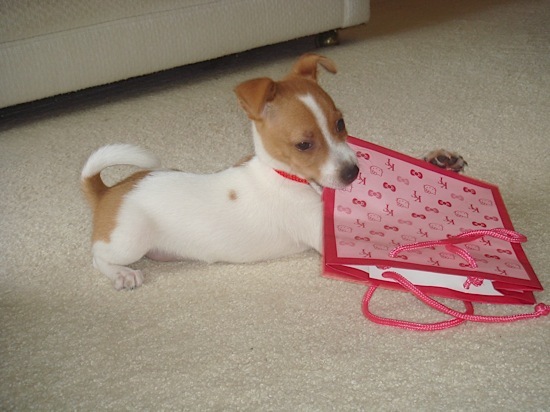 Bookmark this page and visit often to see the latest Jack Russell pictures sent to us. This page will showcase individual photos. If you have a special photo of your dog you would like to share with our users, simply fill out the form below which you can reach by clicking here. Please include a short description for your photo or if you'd like, a story about your dog. This is Max from NoVa and he's seven months old. His favorite game is fetching his frisbee and tennis ball until his humans can no longer move. He's definitely a powerhouse. He is very smart and will be doing more outside training once the weather gets warmer. His favorite place to sleep is at the foot of the bed, unless we're downstairs and he sleeps on the arm of the sofa. 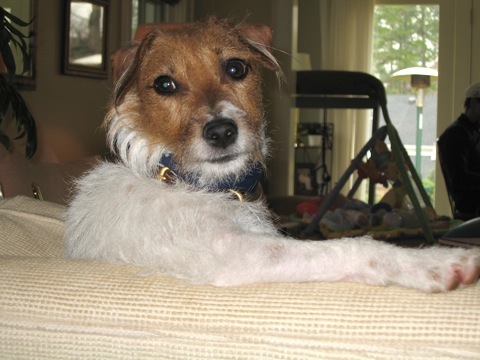 He has two other dogs to hang out with at home, Jack, a Min Pin and Dante, a Toy Fox Terrier. He's a great little guy to have around and is very loyal. No matter where I go in the house, he's right there with me. Brutus is a 2 year old bundle of energy. 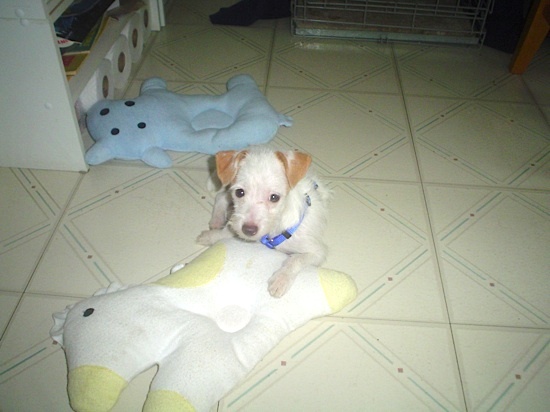 He adores playing and running all the time especially with his favorite stuffed monkey (that is as big as he is). Brutus is intelligent, determined and stubborn. Brutus loves to eat green beans, broccoli and (Fuji only) apples with no skin of course. Brutus is social and adores playing with other dogs at the dog park. His favorite sleep place is between Daddy's ankles at the foot of the bed (Daddy hasn't had a good night's sleep for almost 2 years). All is all Brutus makes our lives better and complete, he is an utter joy and we couldn't love him more. This is Milo. 6 months ago we were blessed to get Milo from friends who could not longer keep him. Milo will be 3 this year. He is the most amazing little dog and has crept deeply into my Fiance and myself's heart. We do not have any kids or other pets, Milo has us all to himself!! Often we look at him and thank our lucky stars that he came our way, our home is now complete. 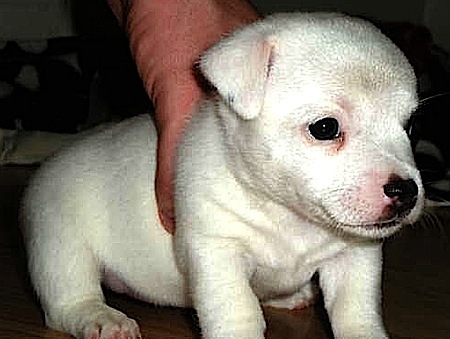 Nala is a short legged smooth coated Jack Russelll puppy born June 19th 2008. 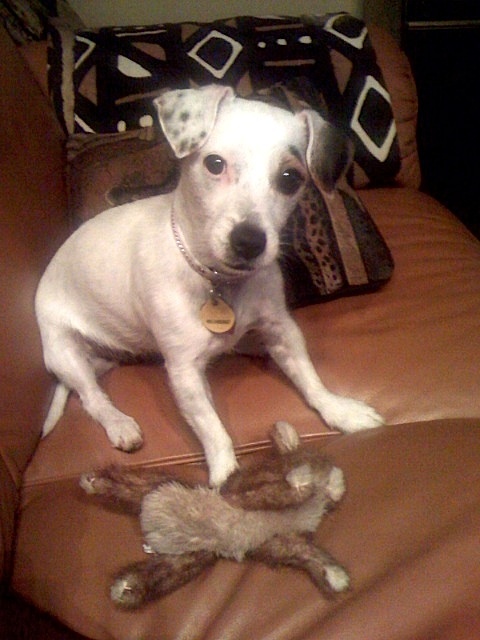 She enjoys playing with her doggy pal, Buddy, a six year old French bulldog X Boston Terrier mix. Nala loves everyone, but especially children. She sleeps with my 8 year old son and walks him to the bus stop every morning, greeting (kissing) all the children on the way. Say hello to Freddie sent to me by Louise in Canada. This is our bundle of joy Freddie.He is almost 7 months old. Makes us laugh everyday. 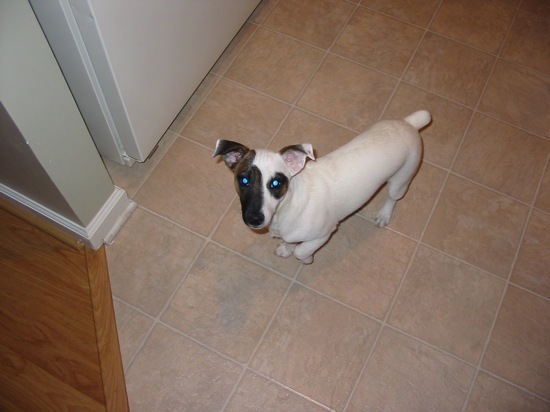 Say Hello to Magnus as seen in the the Surfing Jack Russell Terrier photos sent to me by Doreen. I rescued my JRT Magnus from a shelter a year ago. He is 2 now. We discovered that he loves the water - he swims all the time in the lake but we recently took him to a beach at Long Beach, WA that is half Columbia River and half Pacific Ocean and it's perfect for body surfing. 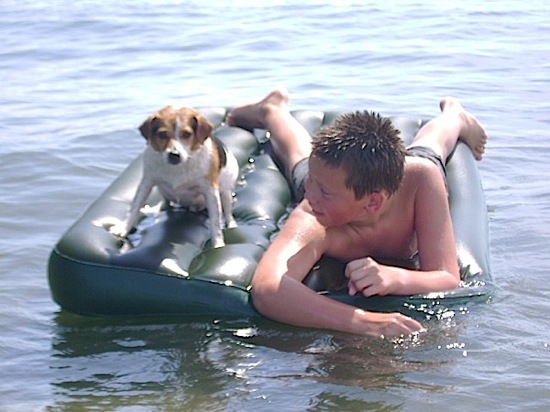 The kids were riding the waves on an air mattress and Magnus wanted to get on - they put him on there and he would not get off! 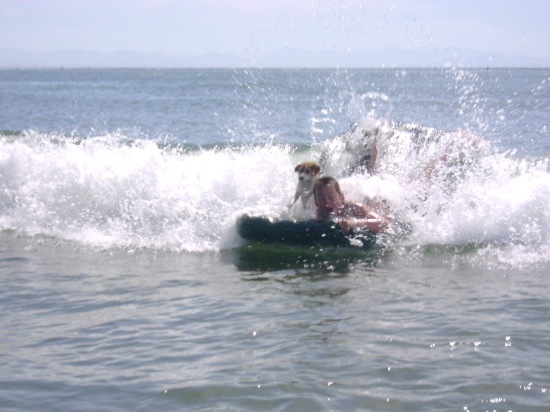 He surfed all day long! 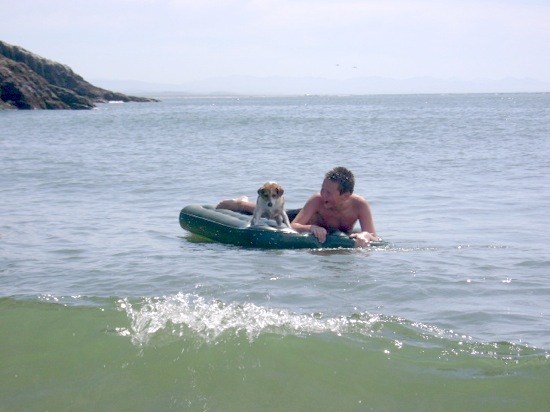 Here are three photos: We call number one - Magnus Chillin', number two - Waiting for a wave and number three - Hang ten! sent to me by Chris in the UK. 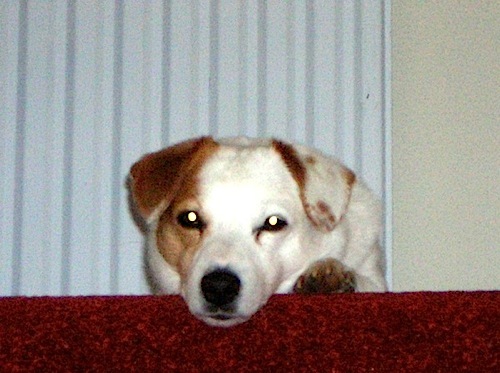 Patch is a 12 year old rescue dog. We got him at the age of 6. Four years ago he saved my life by barking and waking my wife one night when I was fitting in my sleep. I was rushed to the hospital and found it to be a brain tumor. He's my hero! Say hello to Mackenzie sent to me by Steve L.
Here is our 7 month old Mackienzie sitting pretty!!! Say hello to Murphy sent to me by Fran in Florida. 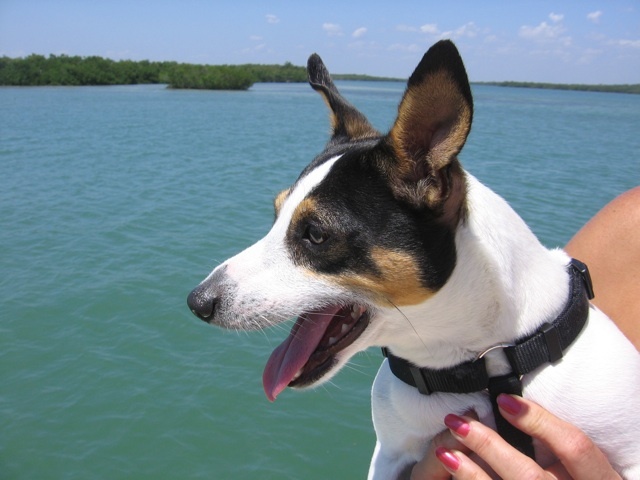 This is Murphy, He lives in Florida and he is on the boat waiting for a fish to be reeled in. Say hello to DJ sent to me by Juliana. This is my baby, his name is DJ . He is quite a character, it's my first Jack and I fell in love with the breed, their personalities are just indescribable. Hello, this is my beautiful boy Jatz (Crackers) he is now 16 months old. He makes me laugh and he makes me cry. When we gave Monster his name it was just a joke at his expected physical size. 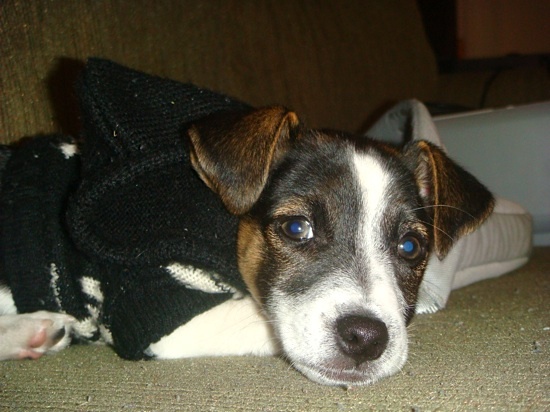 Being first time Jack Russell owners we had no idea how perfect this name would grow to fit his temperament. While he is probably the smartest animal I have ever owned. This guy is a nut!!!! He is notorious for challenging any animal that offer the slightest treat towards him or his families space(especially the larger animals). He is going to give us a heart attach one day. The funny part is that the other animals seem to be terrorized of this guy. Even if the perimeter is clear before letting him out he'll find something to terroize. We live near a wooded area with a creek and things are everywhere. His list of victims consist of groundhogs, squirrels, possums, deer, raccoon (which he pulled down a tree by the tail as it tried to excape. Whew!!!) and just about every other dog that lives in the vacinity except (Nino & Tank). Nino is a 90lb Pitbull/Pussycat that lives around the corner and Tank the 13 month old Boxer from next door. Monster loves them both to death, often playing with either until he passes out for the night. They are his only two male exceptionals in the animal world. The little pretty pup is Chaos. She is five months and thinks she can do anything he does. It is definitely interesting watching her learn from him. She even stops in her tracks like he does when we call her. 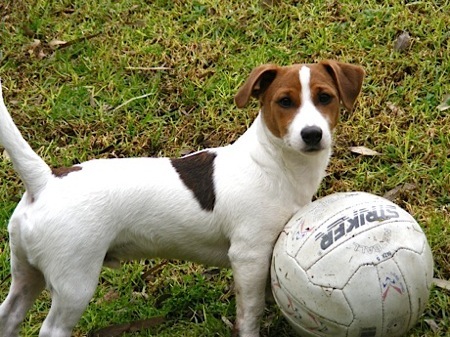 Jack Russell are seriously on another level when it comes to canine intelligence. We thought Monster just special, but I now know its in the breed. For some reason though, she doesn't like people. She barks at everyone that doesn't live in our house. I hope the name my family gave her doesn't turn into a curse like the first one. She is a 2 year old that we rescued from the animal shelter 1.5 years ago. She is smart and very loving. Our family loves her! sent to me by Kim in Raleigh, North Carolina. 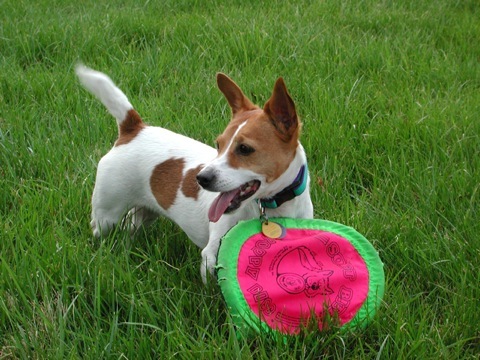 Jack with his favorite frisbee who is 13 years old and still very athletic. Four year old Carly lounging on the couch. If would you like to see your photos included on this page, you can submit by filling out the form below. 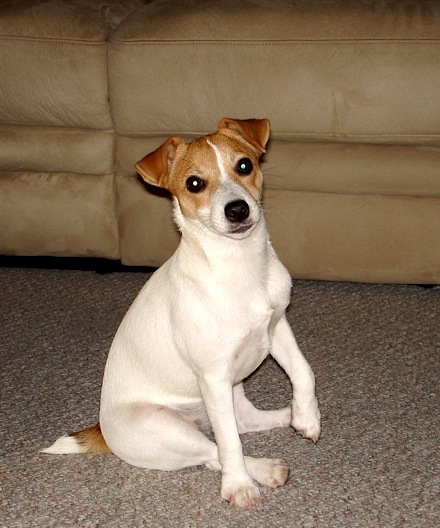 Please include a short description of your dog(s) to be used as a caption for the Jack Russell Terrier photos you send. 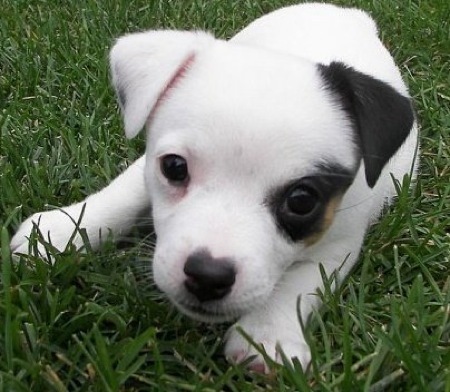 Also feel free to share a story about why you chose a Jack Russell or Jack Russell mix. 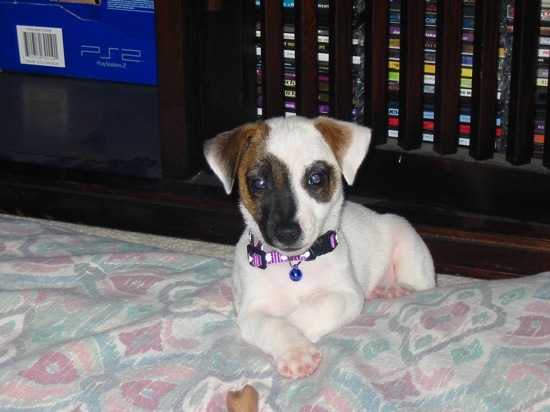 Do you have Jack Russell pictures and a great story about your Jack Russell or Jack Russell Mix? Share it for everyone to to enjoy. 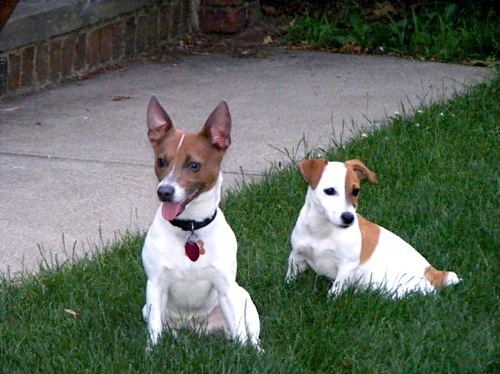 Nate and Snoop - Two Crazy Jack Russell Terrier Brothers! This is my beautiful boy Lobo he is now 4 years old. Sharing a cushion, Fudge and Buddy love the sofa. Baxter is 6 years old. Adopted from a shelter. 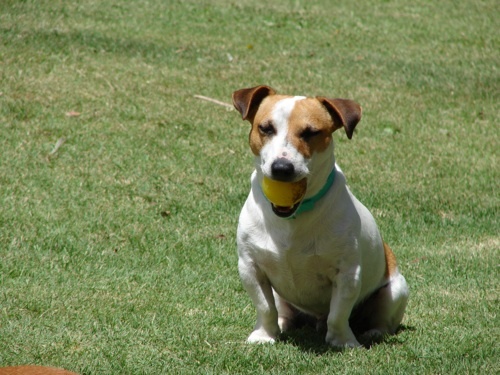 Sawyer is a Jack Russell rescue I adopted in April 2011.